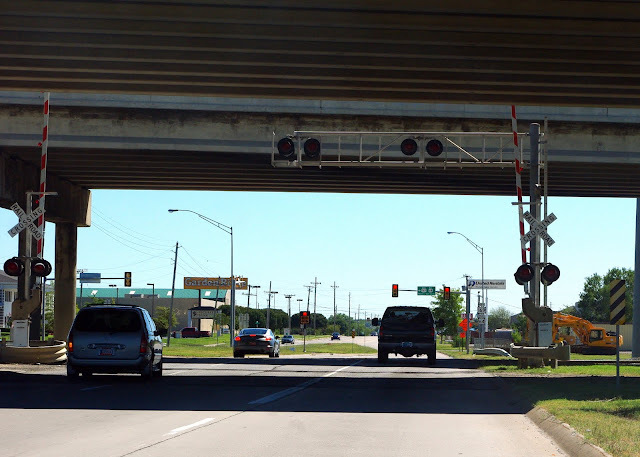 I am one of the many who seem to time it perfectly to be detained at the railroad crossing under 169 on 51st. I have sat there anxiously waiting for a glimpse of the red caboose (i.e. The End of the train) and zoom on my way to wherever it is I'm headed. ...to where there once was a little community there known as Welcome. 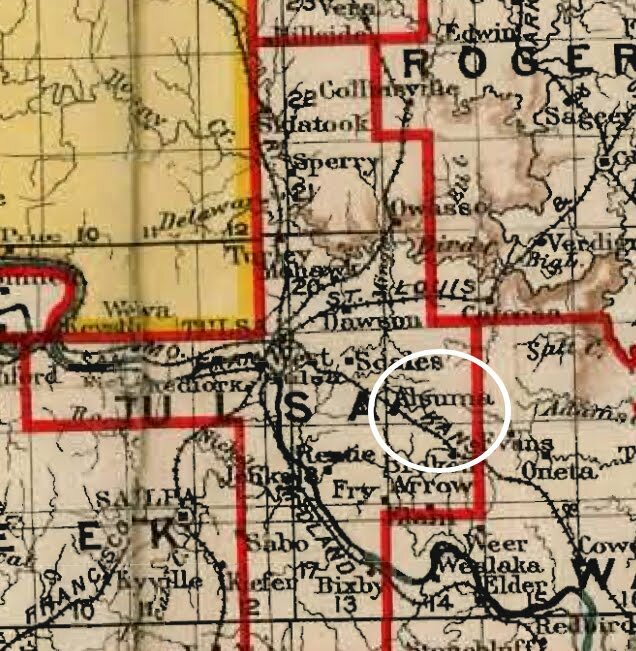 The name was changed in 1906 to Alsuma, I.T. after John Alsuma, a merchant (although other sources site the name was taken from 3 girls' names- Alice, Susan and Mabel). Then, in 1926, it was changed again to Trovillion (or Troxillion) by the railroad company. 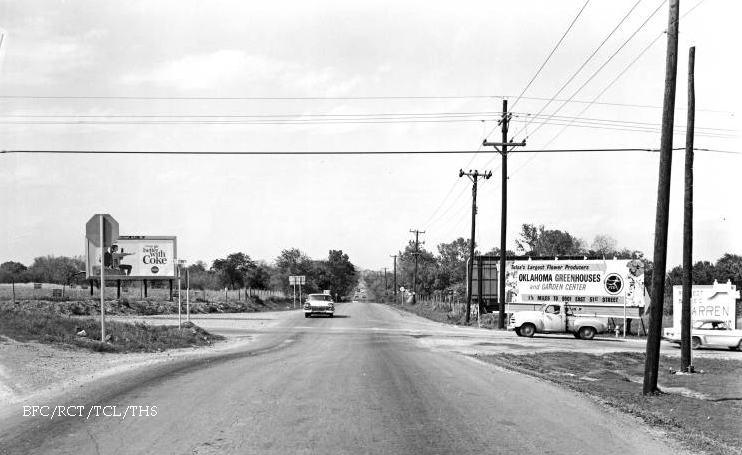 According to some past residents, the sign kept getting torn down until the railroad put the Alsuma sign back up. 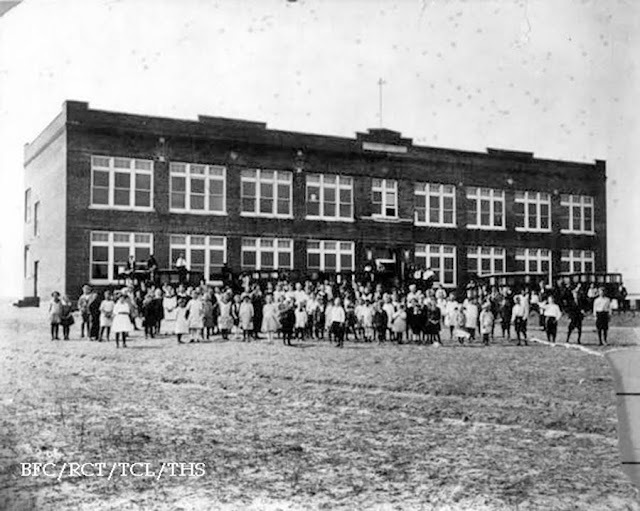 The community was a mixture of both black and white citizens and there were 2 schools, one of them Union and the other Alsuma Separate School. This picture was taken after the children had received smallpox vaccinations. 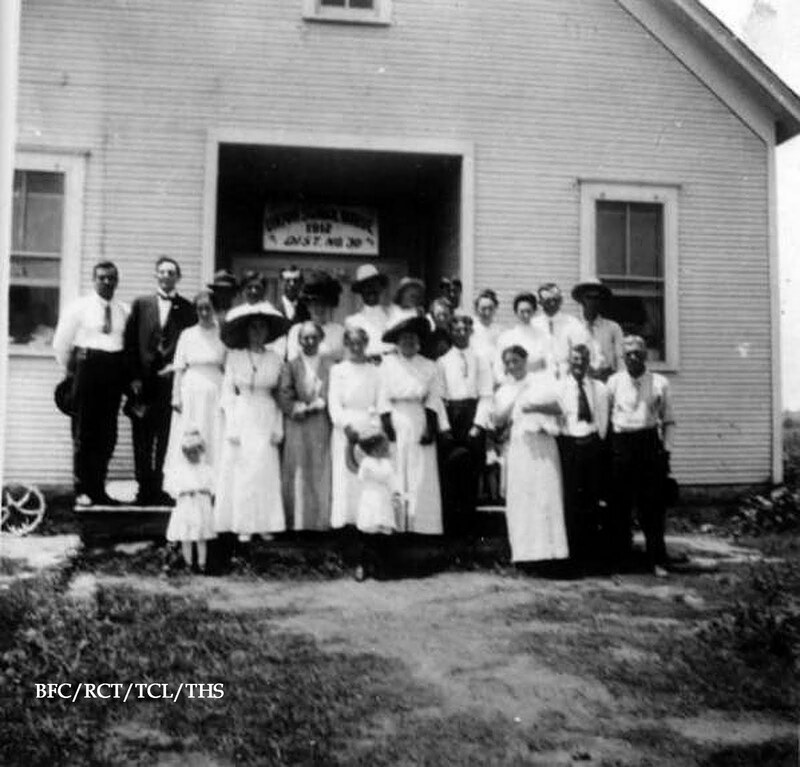 Union School was located south from the town and was formed in 1919 when Alsuma, Mayo, Boles and McCollough were consolidated. 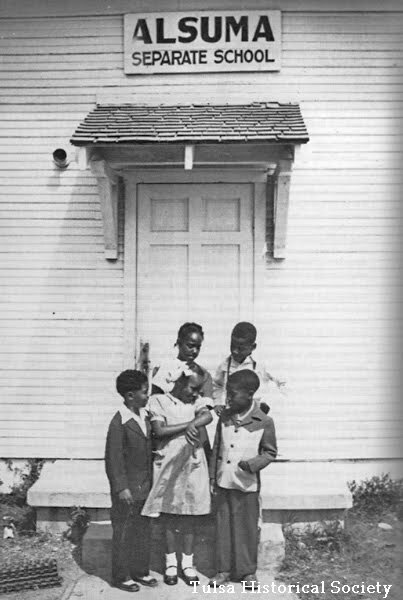 Beryl Ford identifies this photo (below) as being that of the Union school board and teachers. No date is given but the sign over the door looks like it says 1912. 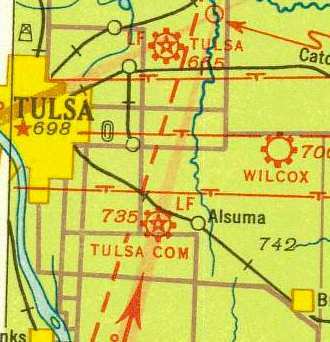 By 1968 the town had been absorbed into the city of Tulsa and the area was rezoned for industrial use. Some of the churches moved to north Tulsa. There is still a listing in the phone book for Alsuma Missionary Baptist Church at 2443 N Peoria. 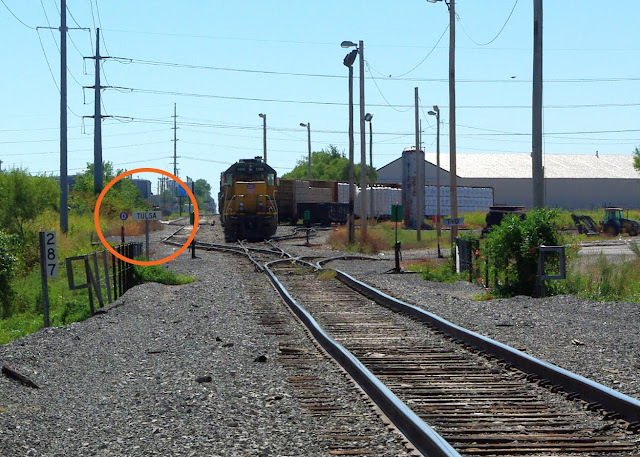 These days, when I am stuck waiting for the train to pass by, I try to visualize the little town that was once down the tracks. The farms and the community that was swallowed up by the Big City. I find I'm not in as much of a hurry as I thought I was…. I also have an interest in Alsuma, since I grew up so close to it; due West by half a mile. The reference to a John Alsuma was made on a ghosttowns.com website by someone named Doug Greene. I'm assuming this where you took your info. There's another web page, however, posted by the Greater Tulsa Reporter newspaper which has a different origination of the name. "According to long-time Alsuma resident DeEtta Perryman Gray, the town was taken from the first two words of three names: Alice, Susan and Mable. Grey did not know who the girls were or why the names were used together." I wish there were more first-hand accounts out there. I've enjoyed your post. Thanks. PS I remember the greenhouse well. I did read that page as well as many others. I did mean to mention the other name origin possibility- thanks for the reminder! I was raised in alsuma in the 80's I know not so long ago. The little white house I grew up in is still standing today. I believe it right across the street from D&L auto. The little store down the street where my grandma would take me to get a candy bar its still there. Days were different growing up there it was as if time stood still. I loved it there. A very interesting story. I remember the catfish farm and 2 lane roads as late as 1980 or '81. Does anyone know where the train stations were at? It would be interesting to explore the old sites if possible. Thanks for the great history lesson! I spent a lot of my childhood in Alsuma. My Aunt and Uncle lived on 48th Street. I remember walking every where in Alsuma. We attended the Alsuma Penticostal church. I spent every summer and almost every weekend in Alsuma. We went crawdad hunting in the little creek. My Aunt and Uncle are both deceased now but I remember Alsuma and the great times I had there. I believe that at one time they actually owned a restaurant there in Alsuma that burned. Their names were Cecil and Minnie Bryant. I hope that Alsuma is not forgotten. I lived in the area from 1962-1977. And graduated from Union H.S. in 1970. Where were the schools of Boles and McCollough located? The "Mr. Goodwin" you mention as having the catfish pond (behind the big house on the SE corner of 51st & Mingo) was E.L. Goodwin the owner/publisher of the Oklahoma Eagle newspaper. One or two of his sons are still associated with that newspaper. Mr. Goodwin was a survivor of the 1921 Tulsa riot. His B.T. Washington graduation prom was scheduled to be on the very evening of the beginning of the riot. His wife, Jeanne was my 6th grade homeroom teacher at Robert Fulton Elementary in 1966-67. She lived to be 103 years old and passed in 2006. 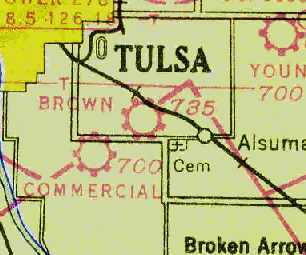 I lived in Alsuma from 1960 to 1998 my dad was lived there as a boy with his mom and dad the Bells. The house in your first picture with the green boards on it, was a store and also a beauty salon. the back part of it was lived in by the Hulls who ran the store. there was gas pumps in the front part. it closed down in 1967 or 68 and Mr Hull sold the land to my Dad and Grandpa. my Grandparents lived across the street till 1979. years before I was born they had a Cafe in the front part of there house. for years the had a sign on the street side of there house that said Bell's Cafe on it. i knew the Bryant's and many others like the Christmas's and the Reeves and my others. I spend. A. Great. Part of. My life in. Alsuma. My. Is. Marvin. Johnson. It. Was. Hays. Then. My. Grandpa. And. Grandmother. Booker. The and. Cleon. Hays. Live right across. The. Street lnfront. Of. The. Train station. Right up. The. Street. From. The. Hardcastle. &hicks. Also the store. In. Fac . My. Grandmother. Owned. Land were. There. Once. Was. A. Cement. Plant Mrs. Goodman. Was. My 1st. School. Before. I. Went union. Robert. Hardcastle. Dean. Hicks. Rick Salisbur . May. Not. Remember. M . But. I do remember. Them. Ok. All. Grew. Up. In. Alsuma. Who. Remember me? Salisbury. Colbert. Johnson. .who. Remember Charles. Piggies. Johnson? Yeah. Alsuma. What. Days it being. Back. I found the blog interesting; however, there seems to be omissions too. One thing which got my attention was the location of Memorial Park. While the map you showed does indeed show Memorial Park to be just inside the borders of Alsuma. Memorial Park has NEVER been on the north of E 51st, it's south of 51st. (Unless it had been moved and I know of no mention of it ever being moved since it was established about that time.) The map itself is in error. But, it was a guess - I guess. This however puts it into the "Legendary Union Area", something that is Omitted too. and Omitted from the blog altogether. 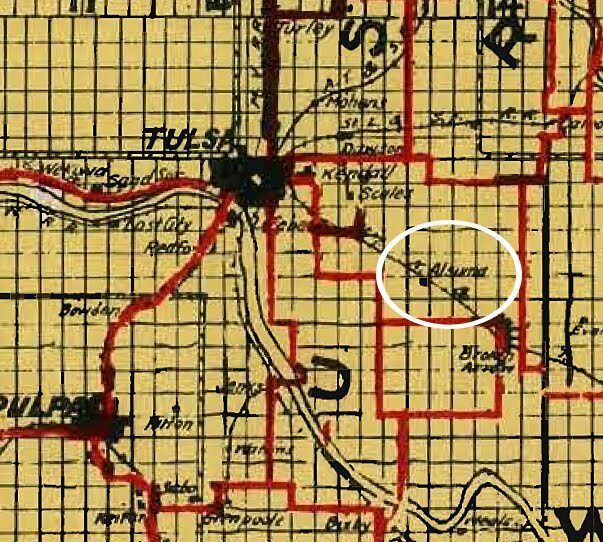 The schoolhouse of Union shown was at one block east of 61st and Mingo (which was the main area of the Union Community), Alsuma stopped at 51st like your map shows. At first, I thought the 1916 map put the bed that "legendary Union Area" had ever existed, until I looked closer at the map. The map has no strong references unless you look at the borders. We know, Broken Arrow east border (as seen from Tulsa) is Garnett;and, we know Alsuma was 51st, so the area north-west of that corner should be the Union Area. I didn't actually see the name Union, but the whole "area" is Marked with a U. I first thought it was a C until I looked at the other areas on the map and Areas were marked with letters with tops facing left. Could this mean "The Union Area?" What else could be "U" for the area? More research will be needed to confirm it, but I doubt U stands for Ukraine. 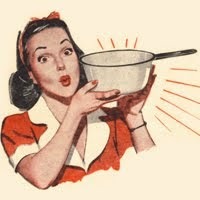 My grandmother owned & lived in the Wilson''s Grocery Store in the late 50's & early 60's. My great-grandfather, Henry Seymour Cupps, owned a grocery / general store in Alsuma in the early 1900's. The Post Office was also in the store. I grew up there too. Rose my bike all over. But my time was the 50s and 60s. I grew up there, my family was the Kelly's. We lived next to Frankie Shook.